Two big announcements today. First, the old RiaServicesContrib.dll file has been replaced with RiaServicesContrib.EntityTools.dll and is now available as a NuGet package. The package name is RiaServicesContrib.EntityTools. Hope that is easy to remember. The other news is that RIA Services Contrib has a new scaffolding system for EF 4.1. Soon after WCF RIA Services support for EF 4.1 was released, Rudi Larno released a scaffolding system for building the DomainServices based on the EF model. Unfortunatly, Rudi doesn't have time to maintain what he built so I am taking it over for him. Today I added the scaffolding code to the RIA Services Contrib project on Codeplex and published it on NuGet. The scaffold is not exactly the same as what Rudi was using. When you create a DomainService using the scaffold you may need to add a new using statement with the namespace where your POCO entities are. Also, I modified what is generated to match the snippet code supplied by Microsoft. Last week Kyle McClellan from the WCF RIA Services team at Microsoft posted his own version of the Book Club sample. Not wanting Kyle to be left out, I decided to MEF up his code as well. I think Kyle is doing some really interesting things with this code, but I think I prefer how John's original code used ObservableCollections (which were really EntityLists) instead of how Kyle is casting everything to IEnumerable or ICollection. What I will be creating next is my version of the Book Club which will be a mix of John's code, Kyle's code, and some completely different concepts that I am working on. Since this blog first opened in June of 2009 it has been named The Elephant and the Silverlight. The name came from John Godfrey Saxe’s The Blind Men and the Elephant. At the time, WCF RIA Services was all about Silverlight and people were arguing about just what WCF RIA Services and Silverlight were. The name made sense at the time. However, this blog has really always been about WCF RIA Services, Silverlight was just along for the ride. Here in 2011, WCF RIA services isn’t just about Silverlight anymore. With the release of RIA/JS, HTML is joining Silverlight as a fully functional client of WCF RIA Services. While I am still primarily a Silverlight programmer, I will be expanding my coverage and my community support efforts to include the HTML platform. So, the name of this blog is changing to just The RIA Services Blog to reflect the new platform agnostic approach I will be taking around here. So, to the HTML JQuery programmers out there, welcome to my blog. Please cut me some slack, it will take me a little while to get fully up to speed on this whole JQuery thing but I am eager to learn. To my fellow Silverlight developers, don’t worry I am not going anywhere. I still strongly believe in Silverlight and most of my development efforts will continue to be in the Silverlight space. 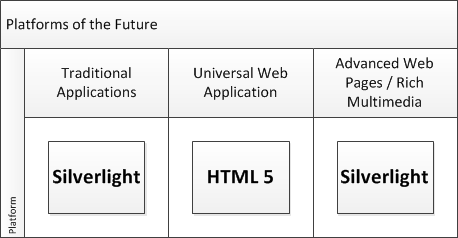 I think there is an opportunity with RIA/JS for us Silverlight developers to show how easy it would be to create fallback HTML versions of our Silverlight applications so that we can get the best of both worlds. Silverlight for the platforms that support it, and HTML for the platforms that don’t. With tools like RIA/JS, maybe this dual approach will not mean actually writing the application twice. Back on December 2, 2010 John Papa gifted the community with an excellent example of proper Silverlight architecture and I have been recommending people watch the video, download John’s code, and follow the pattern to create their own applications. Over the last couple of weeks I have started a new project at work and this time I have decided to follow the example I have given to others. This experience is showing some places where my own preferences diverge from John’s so I have decided to share my changes with the community. I am taking the experiences in my own project and porting them into John’s project. I am not going to dump all of my changes in at once, I am going to be making gradual changes across at least three blog posts. In this first post I will be integrating Marlon Grech’s MEFedMVVM library into John’s code. Over the new two blog posts I will be changing the DataServices to use ICollectionView instead of EntityList and in the third post I will be changing the design time DataServices to use the actual RIA Servics entities instead of separate design time entities. Kyle McClellan on the RIA Services team at Microsoft has come up with something better then what I was working on for parts 2 and 3. 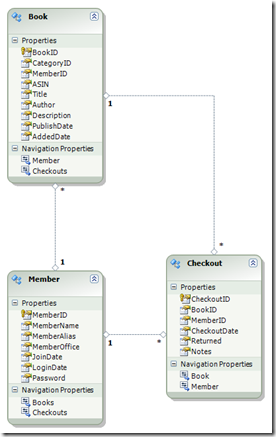 Check it out at http://blogs.msdn.com/b/kylemc/archive/2011/04/29/mvvm-pattern-for-ria-services.aspx. I will be posting up a MEFed up version of Kyle's project. The use of SharedViewModel and NonSharedViewModel mirrors the original design that John used. BookView.xaml and EditBookWindow.xaml will share the same instance of the ViewModel while CheckOutView.xaml will get a new instance of its ViewModel every time it loads. Last step was registering the DataServices and PageConductors. These were registered with MEF using MEFedMVVM’s RegisterService attribute which allows us to set a ServiceType of Runtime, DesignTime, or Both. By registering the DesignBookDataService and the DesignPageConductor as having a ServiceType of DesignTime we will get the same design time data support that John had in the original version. Updated 2/4/2011 - The blog code showed a technique using the IncludeAttribute that turned out not to work. A new technique is now shown. A common question on the forums has been how to use project into POCO objects which are derived from one or more server side entity objects while still being able to query client side against the fields that are not being projected. These discussions usually start with people trying to use the Invoke to load data or discovering that the Query methods do not allow complex objects to be passed in. I have come up with a solution that makes the projected POCO completely IQueryable without having to play games with the Invoke passing parameters to the Query method as XML. For performance reasons, we want to create a new POCO object named MemberCheckout which is a projection of these three tables. MemberCheckout has to be a strongly typed object as WCF RIA Services does not support anonymous typed. The question is, how do we filter MemberCheckout on a value that is not in MemberCheckout itself? For example, what if I want to to query for MemberCheckout objects where a book was published on a particular day. 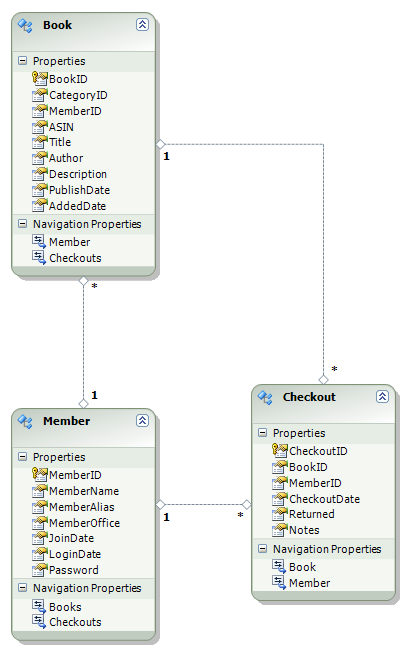 The answer is, if we associate our MemberCheckout object back to the entities that it was projected from then we will be able to query against them. First, we need to modify the MemberCheckout POCO to have a link to the original model. Notice that the only real change was the addition of the Checkout field and an AssociationAttribute. I usually recommend having an Association set on both sides of an association but that recommendation does not apply in this case. The result was a single entity and when I checked what was actually executing on the SQL Server I found that the query had correctly flowed all of the way back to the SQL Server. The recording of the WCF RIA Services Campfire is now available for download here. I suggest right clicking the link and doing a save as. Thanks again to everyone who participated, and to my friends at Radical Thinking who are hosting the download. The Silverlight Firestarter is coming up on December 2nd and I have decided to create a new online event, the WCF RIA Services Campfire. The Campfire event will be on December 3rd at 10:00 CST (16:00 GMT). What is the WCF RIA Services Campire? No slides, no planned demos, just an open forum to talk about WCF RIA Services. To allow this event to be worldwide, I am hosting it through Office Live Meeting. If you are unable to connect to Office Live Meeting's audio features, please let me know what alternate method you want to use. I can probably support adding people through other methods including Skype. The best thing about events like MIX, Firestarter, and PDC is always the common room where conversations happen. With the campfire event, I am going to try and bring that experience to everyone even if we can't all get together in person.